Octavo (210 x 132mm), pp. 416. (Some light spotting.) 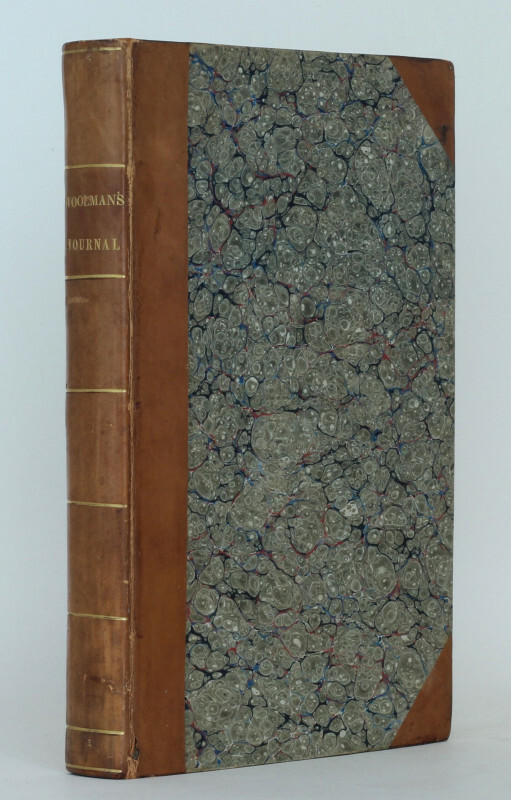 Contemporary British half calf over marbled boards, the flat spine divided into compartments by gilt rules and lettered directly in one, all edges speckled red. (Endpapers a little spotted, extremities slightly rubbed, small hole at foot of upper joint.) A very good, crisp copy. ‘New Edition’. The American anti-slavery campaigner and minister of the Society of Friends (Quakers) John Woolman (1720-1772) was born in New Jersey to a Quaker family and as a young man became a firm opponent of slavery, travelling throughout Pennsylvania, Maryland, Virginia, and North Carolina to speak out against its evils: ‘at Philadelphia yearly meeting on 26 August 1758 [...] Woolman made an impassioned appeal for Friends to abolish the practice of holding slaves: “In infinite Love and goodness He hath opened our understanding … concerning our duty toward this people; and it is not a time for delay’ [...]. On that day the Quakers began the process by which they freed their slaves – the first large body so to do in America. Dean Willard Sperry of Harvard Divinity School says that if he “were asked to date the birth of social conscience in its present-day form” he would place it at the time Woolman spoke at Philadelphia yearly meeting in 1758’ (ODNB). In May 1772 Woolman sailed to England, and travelled throughout the country, arriving in York in September 1772, where he contracted the smallpox of which he died on 7 October 1772. 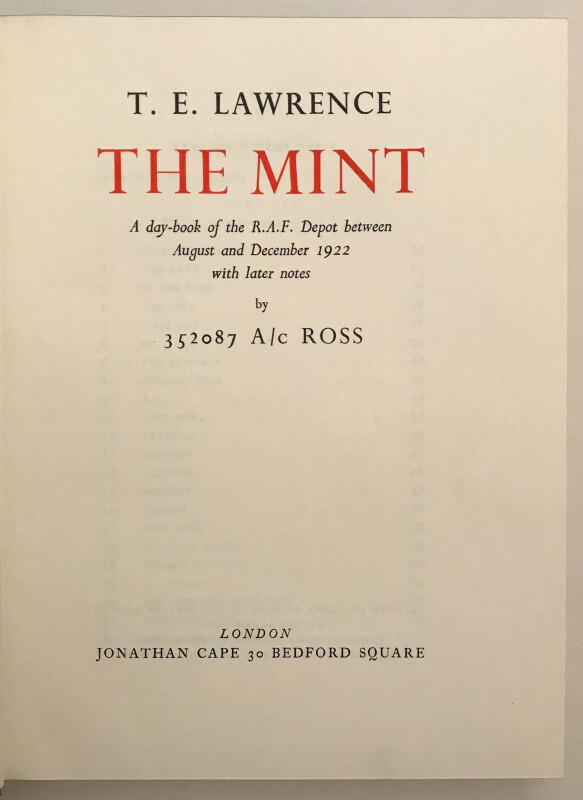 His Journal was first published in 1775, and was widely recognised as a classic of spiritual autobiography, which attracted the praise of John Stuart Mill and Charles Lamb, and has remained in print since its first publication. This edition is divided into two parts: the first is composed of the text of the ‘Journal’ (pp. -246), prefaced by two memoirs of the author: ‘The Testimony of Friends in Yorkshire, at their Quarterly-meeting held at York, the 24th and 25th of the third month, 1773, concerning John Woolman’ (pp. -7) and ‘A Testimony of the Monthly Meeting of Friends held in Burlington, the first day of the eighth month [...], 1774, concerning our esteemed friend, John Woolman’ (pp. -13). 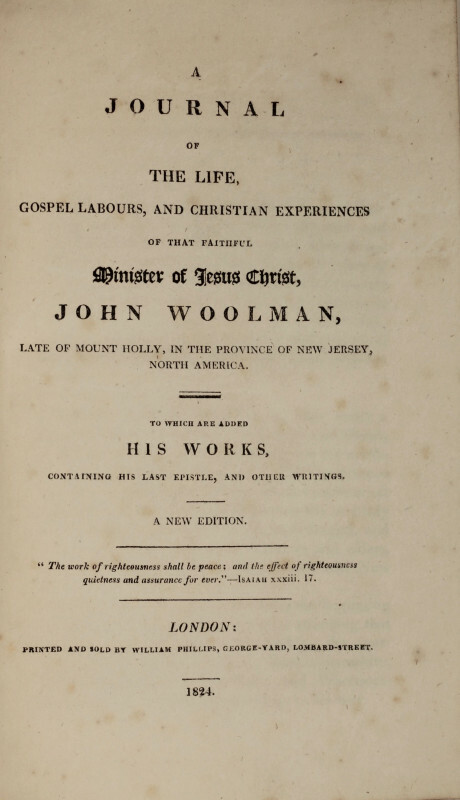 The second part of the volume (‘The Works of John Woolman’, pp. -416) collects five pieces by Woolman: ‘Some Considerations on the Keeping of Negroes’ (first published in 1754); ‘Considerations on Pure Wisdom, and Human Policy; on Labour; on Schools; and on the Right Use of the Lord’s Outward Gifts’ (first published in 1768); ‘Considerations on the True Harmony of Mankind, and How it is to be Maintained’ (first published in 1770); ‘Remarks on Sundry Subjects’ (first published posthumously in 1773); and ‘An Epistle to the Quarterly and Monthly Meetings of Friends’. 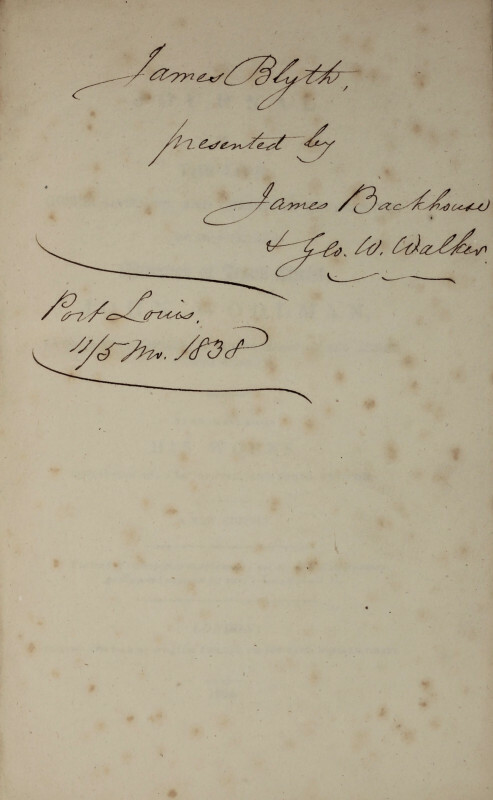 This copy was previously in the library of James Blyth, and was given to him by the distinguished Quaker missionaries James Backhouse and George Washington Walker. 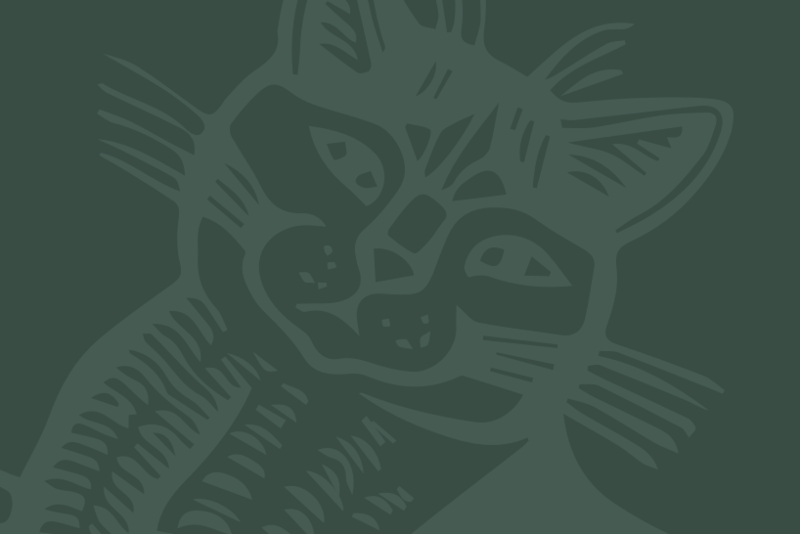 Backhouse was born into a distinguished family of natural historians and horticulturists based in Darlington, and was educated in Leeds, before returning to Darlington. In 1815 James and his brother Thomas purchased a nursery in York, and in 1824 began missionary work in York. Walker was born in London, but brought up in Newcastle upon Tyne as a Unitarian and educated at a Weslyan school in Barnard Castle. In 1814 Walker was apprenticed to a Quaker linen draper in Newcastle and began to attend meetings of the Society of Friends, and, partly due to his friendship with Backhouse, he joined the Society in 1827. ‘In 1831, in obedience to a “call”, Walker accompanied Backhouse on what turned out to be a twenty-seven-year mission to the southern hemisphere. They landed at Hobart Town on 8 February 1832, after a five months’ voyage. Encouraged by the governor of Van Diemen’s Land, Sir George Arthur, they visited convicts, and reported on the living conditions of convicts and Aborigines (there and on Flinders Island). In Launceston they gathered a body of Quakers, who held their first yearly meeting in 1834. [...] After three years in Van Diemen’s Land, Walker and Backhouse went to Sydney and made the acquaintance of Samuel Marsden, the senior chaplain there. When they returned to Hobart, at the request of the new governor, Sir John Franklin, they assisted Alexander Maconochie in the writing of his controversial report on penal conditions. In 1838 they travelled to Cape Town, visiting Mauritius on the way’ (ODNB, s.n. Walker). In 1840 the two missionaries parted ways; Walker travelled to Hobart Town, where he married the Quaker Sarah Benson Mather and settled, and Backhouse returned to York, where he wrote A Narrative of a Visit to the Australian Colonies (London and York, 1843) and A Narrative of a Visit to the Mauritius and South Africa (London and York, 1844). In the latter work, Backhouse recorded that the two missionaries arrived at Port Louis, Mauritius on 7 March 1838, describing the town as ‘beautifully situated on the west side of the Mauritius, in a cove formed by a series of basaltic hills, portions of which are woody: they vary in height from 1,058 to 2,639 feet. [...] The population of Port Louis in 1836, was 27,645, of whom 6,679 males and 6,664 females were free, and 8,247 males and 6,055 females were apprentices. Most of the latter and some of the former were persons of colour’ (Narrative of a Visit to the Mauritius and South Africa, pp. 3-4). They only stayed for some twelve weeks, before they departed for Cape Town on 27 May, but during this time they made themselves familiar with the island and its inhabitants, and in May Backhouse wrote ‘A Letter to Thomas Fowell Buxton, on the State of the Population of the Mauritius’, with a particular emphasis on slavery. On the 27th of April Backhouse and Walker met their friend John Lane, the commander of Stratford, a vessel at Mauritius, and then called upon his employers, Blyth Brothers & Company, the leading shipping company on the island, who Backhouse described as ‘merchants of highly honourable character, who are said to act upon the high principle, “As ye would that men should do unto you, do ye even so unto them,” a principle rarely to be found in operation among mercantile men’ (Extracts from the Letters of James Backhouse, whilst Engaged in a Religious Visit to Van Diemen’s Land, New South Wales, and South Africa. Accompanied by George Washington Walker (London, 1842), II, p, 39), and it seems likely that they met James Blyth, to whom this volume was inscribed, on that occasion. Blyth was an influential figure, who had settled in Mauritius in 1830, had been instrumental in founding the Mauritius Commercial Bank, and was a member of the island’s Legislative Council from 1833 until he returned to England in 1839. He appears to have met the missionaries on a number of occasions in May 1838 before their departure; this volume was inscribed to Blyth on 11 May and Backhouse and Walker stayed with Blyth from 17 May to 18 May at his residence four miles from Port Louis, where ‘Philip Blyth joined us, and we spent a little time very pleasantly, and had much conversation on the state of the colony, the improvement of which appears to be much retarded by the retention of old French law, and by the influence of persons of principles far from Christian in the administration of it’ (op. cit., II, p. 47). Author BACKHOUSE, James and George Washington WALKER – John WOOLMAN. EGERTON, Harriet Catherine, Countess of ELLESMERE. Among the Mountains. Travels Through Asia. LAWRENCE, Thomas Edward and Richard KENNEDY (artist). The Letters ... Edited by Mark Amory. WAUGH, (Arthur) Evelyn St John. My Life as an Explorer.